Remember: Keaxions' punch # 902(no Insert; Insert A & Insert B). Also used: Corrugated paper, buttons, floss, ribbon, distress ink, rubber stamped sentiment, flower, & leftover DP. Well Just Imagine fans that's all of my projects for the month. Hope you all enjoyed them because I enjoyed creating and sharing with you. I have seen these around on the web, but decided to "wing" it when I made mine. I started with a piece of 6x12" cardstock, punched (with no insert) one of the 6" edges of it, with the punched edge out on the MS Score board, I scored at 4 1/4", 4 3/4", 5 1/4" and 9 1/2". Place cardstock right side up and fold at 4 3/4". Turn over and fold at 4 1/4", 5 1/4" and 9 1/2". I used the circle cutter and cut a 2" circle in my cardstock on the front panel, a half inch from the bottom so my bag and treats show. Now you have the base of your bag. 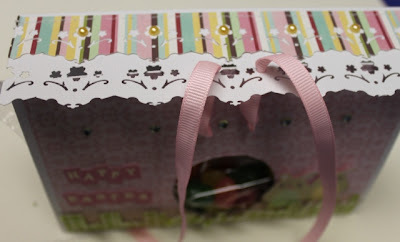 Add patterned paper, embellies and a snack sized or sandwich sized Ziploc baggie filled with treats. I then punched 2 holes with my Crop-A-Dile (yes, I finally used it!) and threaded ribbon through them and tied a bow. Wallah! All done and ready to make someone's day! Hope you enjoy your Easter! Happy Friday! What a difference a week makes. There is a whisper of spring in the air today. 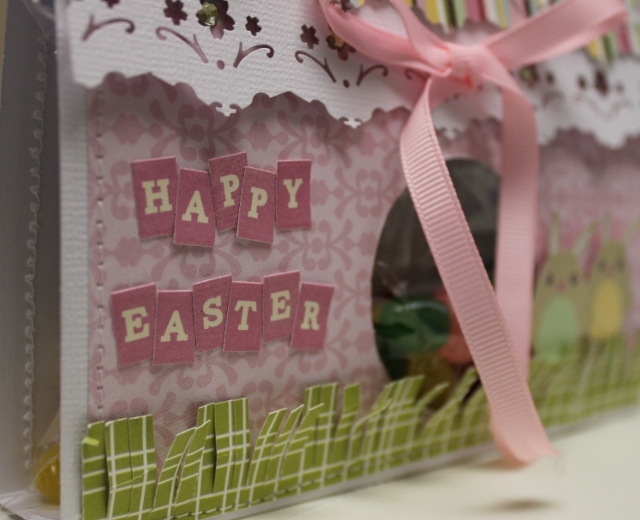 :) In honor of sunshine and warmer temps, I have made a pretty spring card using the amazing circle cutter! I cut a circle for the over-sized center of my flower. I then surrounded it with punched butterflies and hearts in the center. I used the throw away piece from Kreaxions 4 in 1 punch #916 for the "grass". Here is a close-up and you can see how I added sticker sentiments to the leaves of the flower. Have a great weekend! Happy Easter and happy punching! Charity here with a confession to make, the weekend totally got away from me so no tutorial or tip this time. However, I do have this cheery summer layout to show you. I used Punch 901 and the Kreaxions Star Stencil to make rosettes from vellum. I love how they stand out against the colors. I am so addicted to using the punch confetti on my layouts and still haven't gotten over my vellum urge! How about a tutorial next week on how to make these super quick rosettes? Happy Wednesday, All! Hope you are all FANTASTIC! 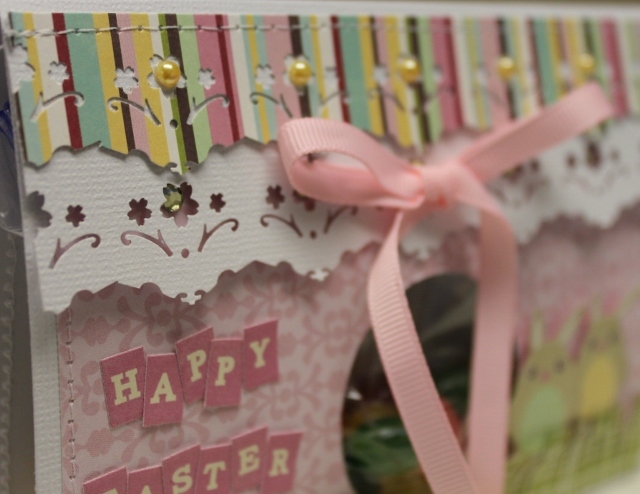 Today I am posting a pretty, little Easter Card made with the Lattice Die found in the Just Imagine Crafts SHOP! I wish all of you a WONDERFUL EASTER! Little Pieces Are Your Friend! with no template. First I cut a large circle with the most amazing circle cutter ever – the Kreaxions Circle Cutter. Then I punched my pieces out of scrap paper and placed the “stars” around the circle. Then I used the little curvy pieces on the bottom to create my “borders” on the mats under my photos. Finally, I pulled out one of my pens and outlined everything just to give them more “pop”. Welcome to another Marvelous Monday with Monica! I know Monday's start off super slow for some people and I can definitely say that is me. So hopefully my post for today will inspire some people to wake up on Monday;s rearing to go and CREATE! I made a mini album today using Teresa Collins patterned paper and Kreaxion punch 924. Closeup of the border - what i did was punch it out but I used the in a sense "scrap" that is what is nice about these punches nothing is scrap! Hope everyone enjoys their Monday - now CREATE!! Hi Nancy here. I am excited to share this two tone fussy "beautiful thing" card with you today. Starting with the Kreaxions Circle cutter to start the centre circular frame and also the circle centre on the matting piece. Then using Kreaxions' punch #910, (using Insert C on corners) finished off the corners. & Stencil B (positioning parts)... we used to mark and position all the punches around the inner circle. Matting the white with blue and white behind the blue makes everything pop just perfectly. Cute pearl accents and stunning ribbon bow are a touch of elegance with the fussy punched frames. 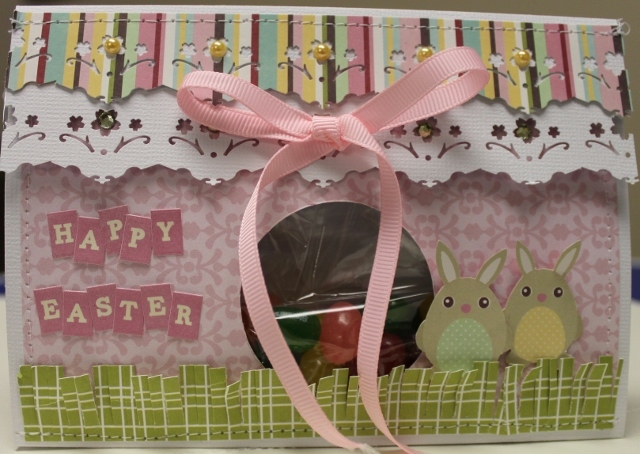 Also used: Bazzill cardstock, ribbon, pearls, distresss ink & rubber stamped sentiment. Thanks for stopping by and sharing your day with us! Happy Friday! I am very excited to share that I used my Big Shot Die Cutting machine for the first time ever this week. I've had it for ages and just never learned or cared to use it. Well, I'm hooked now! I got this pretty butterfly die and have been playing with it all week! Isn't it beautiful? For my Happy Spring project, I used Kreaxions 4 in 1 punch #903 (flowers) to give an eyelet effect on my die cut butterfly. Here are 2 close ups of the butterfly. After I die cut the butterfly I carefully folded it in half at the body and used the flower punch and did the same thing for each of the wings. I then unfolded it and punched the rest of it till I had the effect I was looking for. I then used that same punch (without any inserts) for a card stock border which I sewed to a piece of pattern paper for my tube insert. Have a great weekend and happy punching!